The Guest network is a feature of the Linksys Smart Wi-Fi routers and the Linksys X-series gateways that creates a separate network for guests. This secured network provides Internet access to wireless devices, with the router limiting communication with other computers and doesn't allow file and printer access. It has a different password from the main network. NOTE: The E2100L and E900 do not have Guest access feature. On the main computer, launch Linksys Connect by clicking on the icon on your desktop. NOTE: In case you cannot find the icon on your desktop, click here to know alternative methods to launch the software..
Click on Guest access to display the settings of the Guest network. Take note of the Guest network Password. NOTE: The Guest network is a secured network by default. It will appear unsecured in the list of available wireless networks. However, guests are always required to enter the guest access password once they open a web browser. 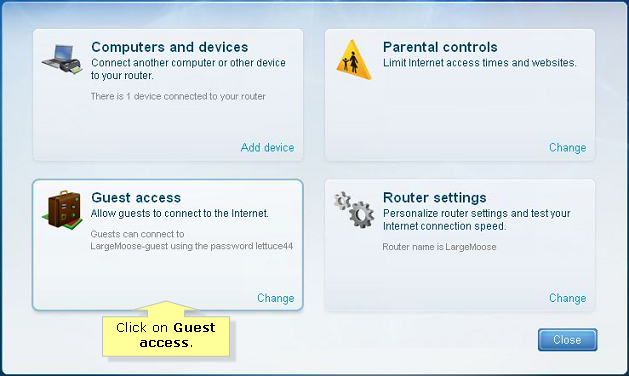 QUICK TIP: In the latest models of Linksys routers, you can configure the Guest access feature in the web-based setup page. To know how, click here. On the main computer, launch a web browser such as Internet Explorer™ or Safari™ and enter your router’s IP address or “myrouter.local” then press [Enter]. When the Linksys Smart Wi-Fi Account login page appears, enter your Email Address and Password then click Log in. 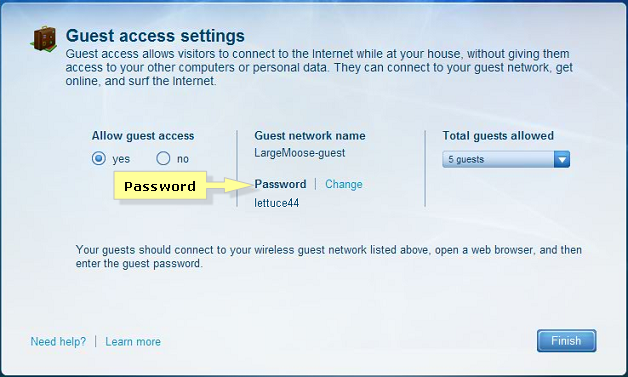 In the Guest network name and password section, you will see the Guest network name (SSID) and Guest network password displayed on the page. QUICK TIP: If you would like to change the Guest network name and password, you may click Edit and enter your desired guest password in the Guest network password field. If you want to change your Guest network name, change your home wireless network’s name first as it will always follow your main network’s name.